Allegany (1997, 1998) is the high school which has won the State Girls Cross Country Championship two times. From: Maryland Public Secondary School Athletic Association (MPSSAA) website. 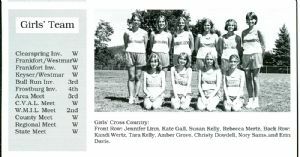 The photograph is of the 1998 Allegany High School cross county team.